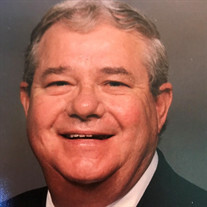 Dwayne Lynn Lasiter, 82, of North Little Rock, died June 27, 2018. He was born in Brummitt, Lonoke County, Arkansas, to Roy and Amy Lasiter on December 15, 1935. Dwayne was a U.S. Navy veteran and a life long member of Baring Cross Baptist Church. He was a graduate of the 1953 class of North Little Rock High School and attended the University of Arkansas at Little Rock. Dwayne was a loving husband, father, grandfather and great grandfather. He was our love, our champion, our protector, our teacher, our jokester, our rock. He worked hard all of his life to provide for his family. He was the center of our family and will be missed forever in our hearts. Dwayne was preceded in death by his mother and father; his brothers, Billy Roy Lasiter and Mannie Lasiter; sister, Peggy Lasiter; and his nephew, Michael Lasiter. He is survived by Laura Lasiter, his wife of 57 years; his daughters, Laurie and her husband, Bob Harris, Wendy and her husband, John Gregan; and his beloved three grandchildren, LauraJane Libkie, Taylor Eller and Isabel Gregan. He was delighted and so in love with his first great grandchild, Hayes Eller, and recently was blessed again with the birth of his second great grandchild, Hallie Grace Eller. His grandchildren were the lights of his life and he loved them beyond words. He is also survived by his brothers, Tommy J. Lasiter (Pam) and Ronnie Lasiter (Susan); his sister, Sandy Kay Simmons; and his nephews and nieces, Alan Simmons, Allison Hester, Ryan Lasiter, Christie Schmidt, Holly Woprice, and Paige Lasiter. Dwayne never met a stranger. He loved people and people loved him. He loved to talk with people and enjoyed his monthly high school classmates lunch and visiting with neighbors and his friends, including the clerks at his local grocery store. He worked for many years at Hoerner Waldorf/Champion Int'l/Stone Container, holding several jobs, including steel rule die maker and had wonderful coworkers whom he loved (he recently attended their annual picnic and really enjoyed seeing everyone again). After retirement, he enjoyed spending time at home, puttering in his workshop, driving LauraJane and Isabel to school and back all the way from grade school through high school, digging holes for his wife's garden (of which there were many), and watching his favorite teams play football. The family would like to thank Dr. Caldwell, Dr. Rasheed, Dr. Greenwood, and the wonderful staff of doctors, nurses and respiratory therapists in the CC Intensive Care Unit at Baptist North Hospital for their care and treatment of Dwayne in his last weeks of life. We appreciated the loving care and concern shown by Dr. Sauer and his staff at Baptist Hospice. Those who desire may send memorial donations to Baring Cross Baptist Church, or to the charity of choice in Dwayne's name. Funeral service will be 11:30 a.m., Thursday, July 5, 2018 at Smith - North Little Rock Funeral Home. Visitation will begin one hour prior to the service. Burial will be at Arkansas State Veterans Cemetery, in North Little Rock.